Citigroup's shares trade for a bigger discount to book value than any other blue chip bank stock. There are many reasons to buy and own shares of Citigroup (NYSE:C), but the best reason right now is its valuation. Bank stocks aren't generally valued in the same way that other stocks are. Most investors look to the price-to-earnings ratio to gauge how cheap or expensive a stock is. The higher the P/E ratio, the higher the valuation, and vice versa. For instance, shares of Wal-Mart trade for a P/E ratio of 15.6. This means that you have to pay $15.60 for every dollar of the company's earnings. Amazon.com, by contrast, trades at a P/E ratio of 208.6, a higher multiple that reflects the e-commerce giant's growth potential. The P/E ratio is a helpful way to gauge bank stock values as well, but investors in the industry tend to prefer the price-to-book-value ratio. This is the metric that allows you to see the best thing about Citigroup's stock. There is no hard-and-fast rule to determine whether a bank is fairly valued. That's because the industry's profitability and thus share prices tend to fluctuate with the business cycle. When times are good, bank stocks trade for high multiples to their book values -- two times book value or more. But when the economy is under pressure, so too are bank stock valuations, often dipping below one times book value. You can see this in a chart of Citigroup's valuation over the past decade. Prior to the 2008 financial crisis, the New York-based bank was valued at more than twice its book value. But now its shares trade for a 35% discount to book value. C Price to Book Value data by YCharts. To put all of this into perspective, the average bank stock on the KBW Bank Index, which tracks two dozen of the nation's biggest banks, trades for a price-to-book-value ratio of 1.16 -- a 16% premium to book value. Of the 23 banks on the index, in fact, Citigroup's stock is the cheapest. There are reasons, of course, that Citigroup's shares are valued at less than other blue chip bank stocks. The most important is the fact that Citigroup is far less profitable than it once was. Over the past year, Citigroup's return on equity, the primary profitability metric in the bank industry, was 7.3%, according to YCharts.com. That's meaningfully below the double-digit range that investors like to see at a bank like Citigroup. Unless the bank earns a return on equity of roughly 12%, it's said to be destroying shareholder value, after an investor factors in the opportunity cost of not investing his or her money elsewhere. 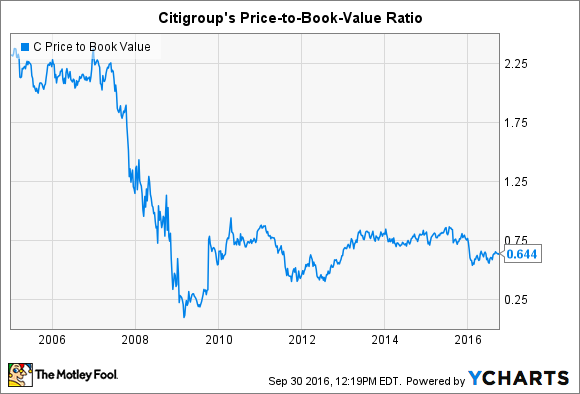 Until Citigroup passes that threshold, or is expected to do so, there's little reason to think that its share price will eclipse book value. The point here is that Citigroup's stock is cheap, which is the best thing about it. At the same time, however, it's cheap for a reason.